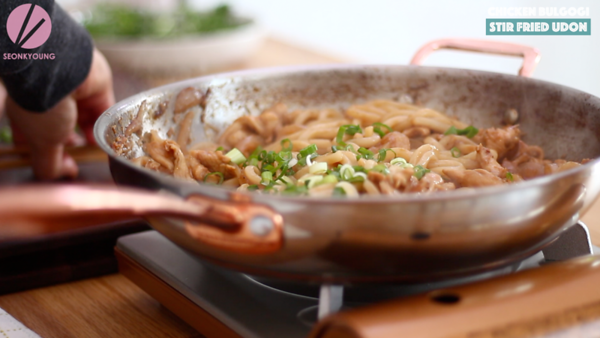 Let’s make Chicken Bulgogi Udon! How delicious this sound?! 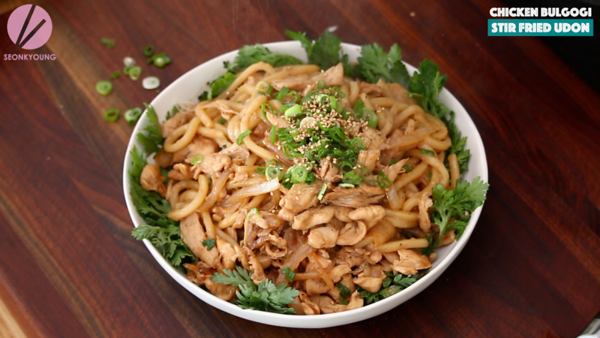 Sweet & savory chicken bulgogi and thick udon noodles stir fry together… YUM! 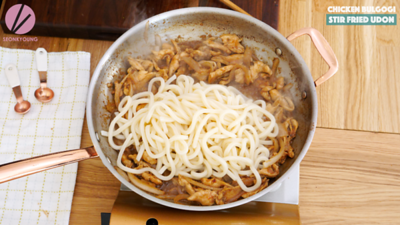 To make chicken bulgogi udon, we need to prepare the chicken breast. Slice chicken breast thin as possible. 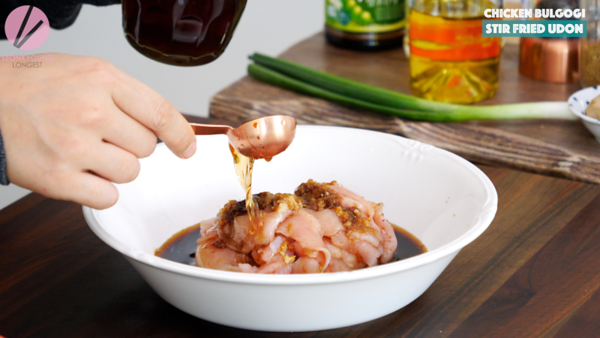 Combine chicken, garlic, giner, soy sauce, mirin, plum extract, sugar, sesame oil and black pepper in a mixing bowl. You can use red or white wine to substitute mirin & plum extractt. Mix well and set a side. You can marinate over night but not necessary, about 10 minutes will do the job. 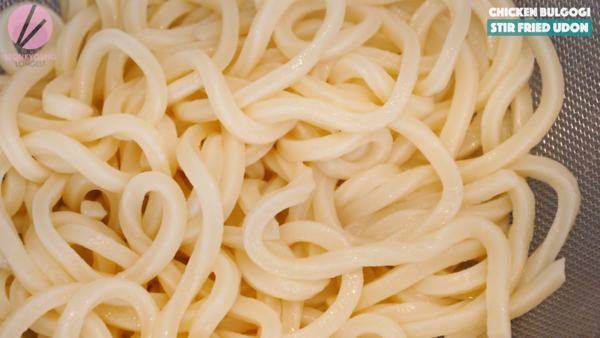 Run frozen udon noodles under hot water (not boiling water, just hottest water you can get from faucet) until it’s soften. Then rinse under cold water and drain. Set aside. 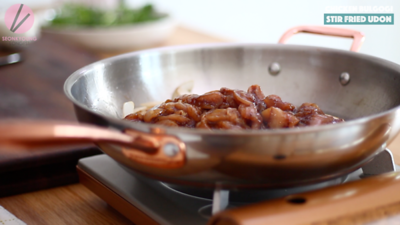 Heat a large skillet or wok over high heat, add cooking oil. 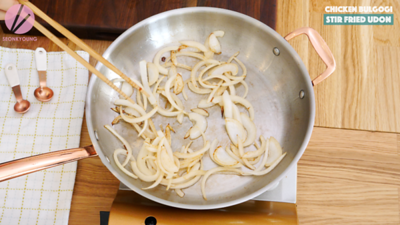 Add sliced onions and stir fry for 2 minutes or until the edges are golden and most of the onions are soften. 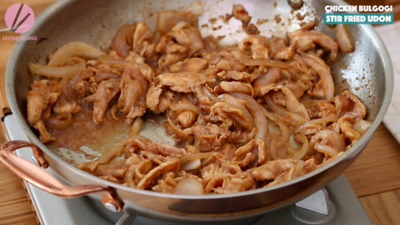 Add marinated chicken and stir fry for 3 to 4 minutes or until chicken is fully cooked. 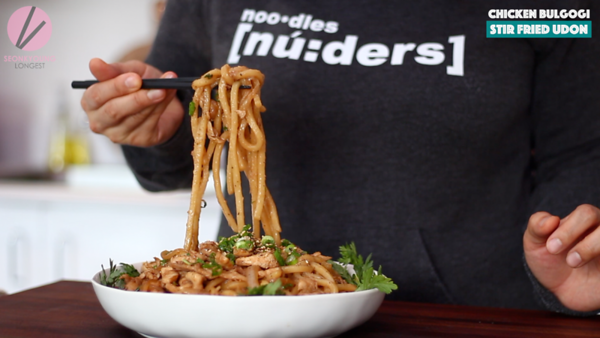 Add the prepared noodles and stir fry everything together about 2 to 3 minutes. Add half of the chopped green onion and toss. Remove from heat. 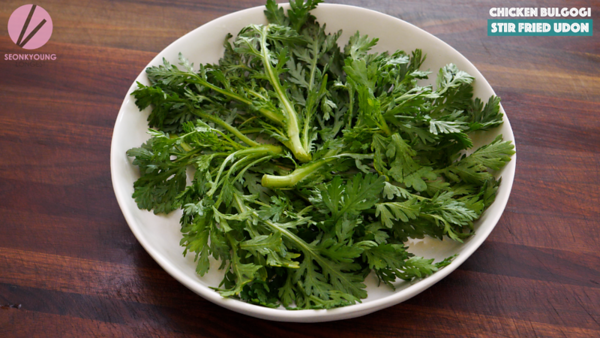 I decorate my serving plate with crown daisy, but you can skip it or use baby kale, angular or baby spinach. arnish with remaining chopped green onion, sesame seeds, sesame oil and black pepper. 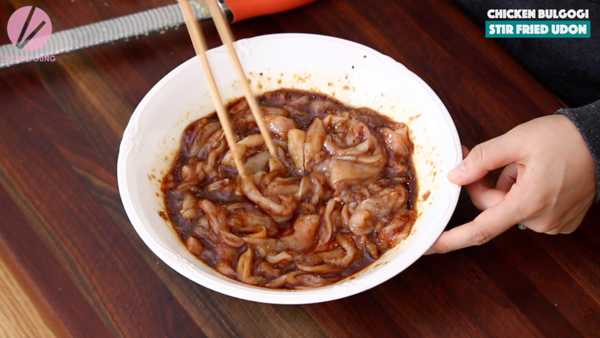 Serve with your favorite kimchi or sriracha for a spicy kick. 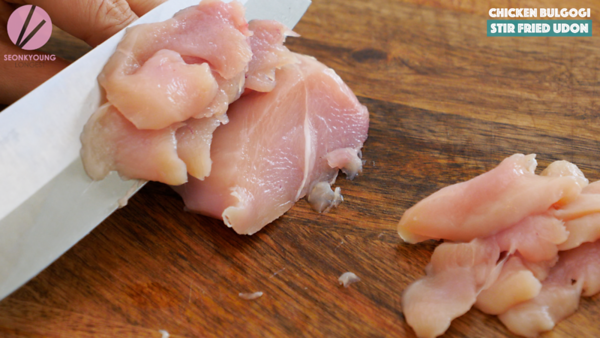 Slice chicken breast thin as possible. 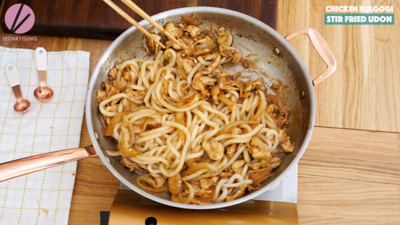 Combine chicken, garlic, ginger, soy sauce, mirin, plum extract, sugar, sesame oil and black pepper in a mixing bowl. You can use 3 tbsp red or white wine to substitute mirin & plum extract. Mix well and set a side. You can marinate over night but not necessary, about 10 minutes will do the job. 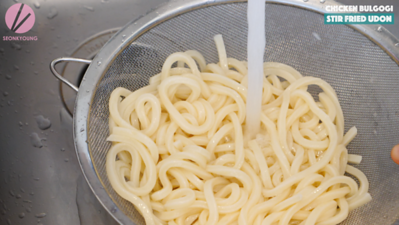 Run frozen udon noodles under hot water (not boiling water, just hottest water you can get from faucet) until it’s soften. 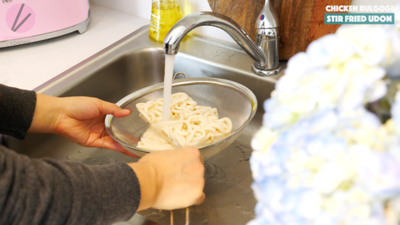 Then rinse under cold water and drain. Set aside. 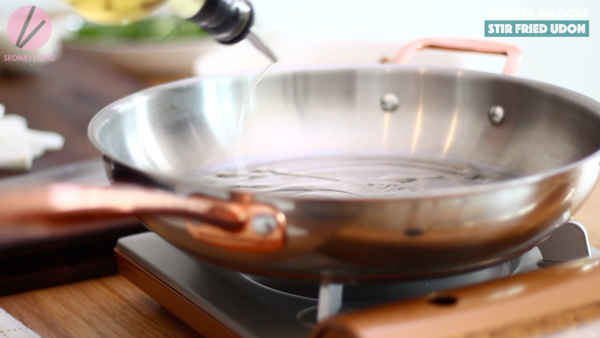 Heat a large skillet or wok over high heat, add cooking oil. 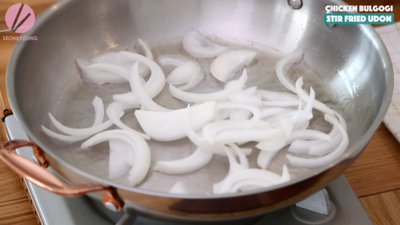 Add sliced onions and stir fry for 2 minutes or until the edges are golden and most of the onions are soften. Add the prepared noodles and stir fry everything together about 2 to 3 minutes. Add half of the chopped green onion and toss. Remove from heat. Serve on a serving plate (I decorate the plate with crown daisy, but you can skip it or use baby kale, angular or baby spinach.) and garnish with remaining chopped green onion, sesame seeds, sesame oil and black pepper. Serve with your favorite kimchi or sriracha for a spicy kick. Enjoy! You can use 3 tbsp red or white wine to substitute mirin & plum extract. Would this taste good with tuna instead of chicken? If I don’t have the plum extract , what can I use instead ? Hi! 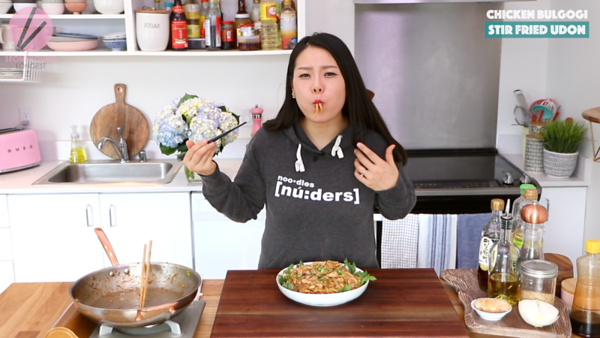 When do we add the garlic and ginger? When you are marinating the chicken.